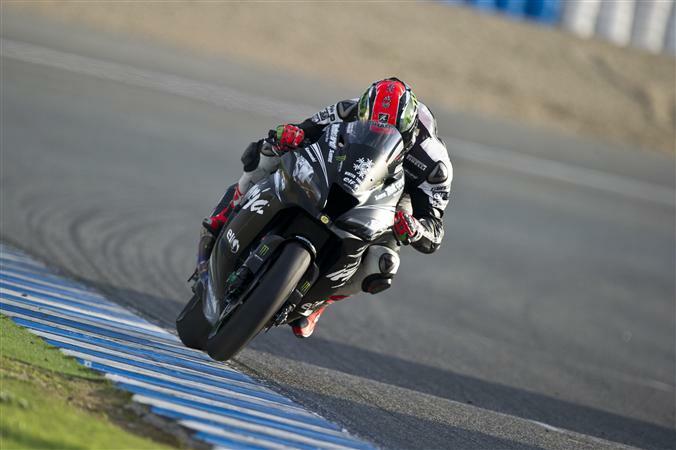 Tom Sykes (KRT) secured the fastest time of a two-day test at Jerez in Spain after a strong showing of overall pace. His team-mate Jonathan Rea took the seventh best time, as the reigning champion worked on optimising the base set-up of the new Ninja ZX-10R in readiness for the new WorldSBK season. The track conditions at this test did not replicate the grippier ones the team found in their previous Jerez outing in November. Despite this relative lack of grip Sykes managed to be the only rider from the 27 present who got inside the 1’39 bracket with his 1’39.924, achieved after using a qualifying rear tyre. Rea, who did not use a qualifying rear, still set a best lap time of 1’40.856. He continued to experiment to find his ideal base setting on the new Ninja ZX-10R, which he and Sykes both rode in the recent global launch of the new Kawasaki showroom model in Malaysia. Sykes has settled into the on-track groove of the new Ninja ZX-10R WorldSBK machine comfortably from the first tests. At this Jerez test concentrated on reconfirming the choice of some items that were settled on before the winter break. Rea did not make a long run at this test, preferring to make lots of laps on used tyres, as he and his crew evaluated different chassis settings and engine characteristics. A damp track surface to start on day one and fog early on day two held back the overall lap count for all riders at Jerez but conditions improved to ensure a productive period of work in the sunny afternoon sessions. Sykes managed to put in 126 laps and Rea 122 across the two days. The entire KRT squad will now move right across Spain to make their final European winter tests at the Motorland Aragon circuit, between 3 and 4 February. The first races of the year take place in over final weekend of February, under the new format of one race on Saturday and the second on Sunday.